I read the book many years ago when it first came out in hardcover and found myself laughing hysterically the entire time I was reading it.I loaned it out to a friend but never got it back because they loved it so much and thought it was hilarious as well.Subsequent copies that I have bought over the years were also never returned after being loaned out.Everyone loves the book and it is one of the funniest that I have ever read. 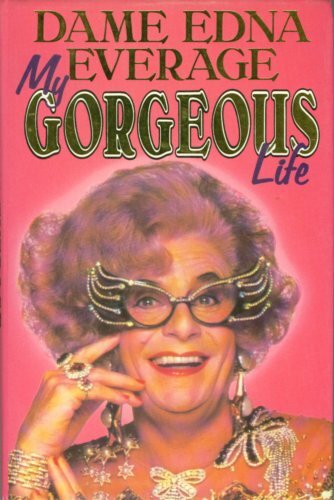 I've been a fan of Dame Edna's for years and I have to say that this faux autobiography is one of the funniest books I have ever read.Starting from her humble beginnings (with mauve hair even then) we see our lovely Edna blossom into womanhood, marriage and motherhood---though she rarely has time to properly look after the kids because of her hectic and famous life.As an advisor to the rich, famous and royal (a spin doctor, in her words, to the Queen), Edna becomes a superstar in her own right---struggling with her troublesome childhood friend, Madge Allsop, who Edna lets us know, is a burden a good deal of the time!Edna deals with many dramas----her eccentric children, her husband with his desperate prostrate problem and the trials of being so easily recognizable to the general public.If you wanna read a book with a great deal of laughs, try to find a copy of this book.You won't be disappointed. It's a joy, and Dame Edna never fails to bring me back to a gentler reality. I'm sorry to say that it hasn't been rereleased in Audio CD. I'm hoping that it will be available in that format in the future. Barry Humphries admirably fleshes out the life of his most famous comic creation - Dame Edna Everage from Moonee Ponds housewife to beaming megastar. 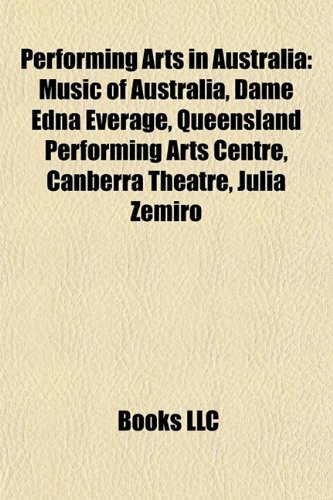 Like on TV, Edna is an outrageously egotistical tyrant who wefind out has bullied Madge Allsop since High School and even danced withher cultural compatriate Les Patterson at a teenage formal. 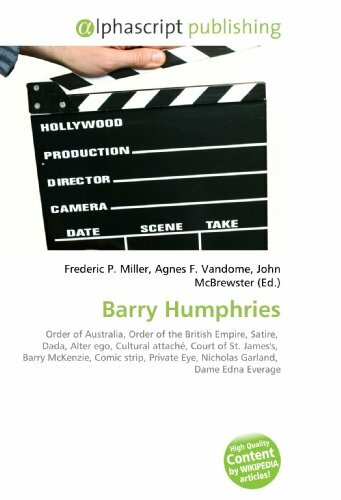 Here you willsee how Edna saved Barry Humphries stage debut and has had him under hersolicitors thumbs for several years.For sharp Edna/Barry enthusiasts thereare a few questionable moves Humphries has made in the book though - 1) Heis cheeky in that he leaves out a number of years in Edna's life as he didin his own biography. Why? 2) Edna started off as shy and genteel in the50's. Here she is as bold as brass all the way. No real character change.3) Her nephew "Barry McKenzie" is never mentioned. They did go toEngland together and do two movies together after all. Yet, despite thesequibbles, there is Humphries characteristic razor sharp wit throughout andeven a moving epilogue where Edna visits her husbands grave. In this thereis a wonderful pathos which makes Humphries dedication to his character andhis audience first class. 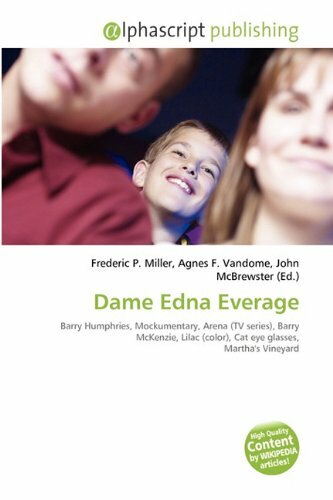 Fans should look for other out of print Ednatitles such as "Dame Ednas Coffee Table Book" if they enjoy this. A Must Read for Dame Edna Fans! 4. Dame Edna''s bedside companion; with forewords by Beverly Nichols, Margaret Drabble and Beryl Bainbridge. John Lahr is one of the most celebrated critics of the performing arts. Winner of Britain's 1992 Roger Machell Award for the best writing about public performance, Dame Edna Everage and the Rise of Western Civilisation is an insider's account of a great clown and a great act. 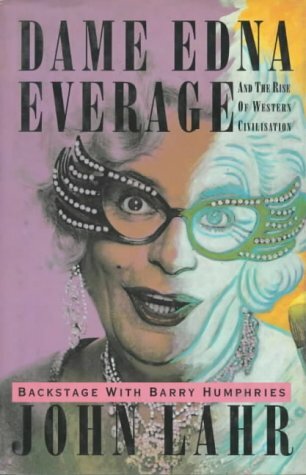 It takes us backstage at London's Theatre Royal in Drury Lane, with Barry Humphries, and into the weird and wonderful world of his show-stopping creation--Dame Edna Everage. Humphries is a prodigious comic talent. His copresence in Edna-- a character so real to the public that her autobiography, My Gorgeous Life, appeared on the nonfiction list--actively invites speculation about reality and fantasy, male and female. With her "natural wisteria" hair and her harlequin eyeglasses, Dame Edna was the first solo performer to sell out the most famous theater in England, and she also took the United States by storm, filling theaters from coast to coast. Hilarious and malign, polite and rude, highbrow and very low, the character Barry Humphries inhabits is a bundle of contradictions. Barry Humphries is a genius.No book is ever going to do justice to seeing him perform live, but John Lahr has come close.If you're a Dame Edna fan, you don't want to miss this book. Beyond creating an indelible character, Humphries is a master improv comedian.In November 2003, I saw 'Dame Edna' live at a Dallas, Texas appearance. (S)he balanced five or six active storylines that were conjured up in conversations with various audience members.How the evening went totally depended on what Edna pulled out of those people.The results had the audience rolling in laughter and shocked at how much wonderful material could get mined out of what didn't appear to be much to work with. If I had 10% of Barry Humphries talent, I would be very happy. Put the words "Barry Humphries: Living National Treasure" before the title above this review and you will have my full intended heading. Thank you. For anyone who is a fan of Humphries and his characters this book provides a detailed insight into the creative force and intellect that has produced the best comedy theatre in the world. 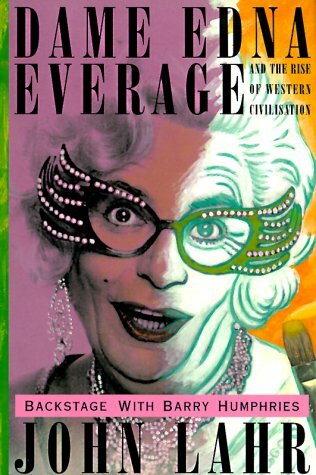 For any of the new American fans of Dame Edna, this book may go some way towards filling in what you have been missing out on since Edna Everage made her quiet and unassuming debut in Australia nearly 50 years ago. Humphries' heavy touring schedule in the US is your gain, and our loss. If you haven't seen the show, do whatever it takes to see this man and his characters on stage. I have never seen theatre which could have an entire audience bent over in laughter, tears pouring down their faces, at the mere sight of a character walking across the stage - Sir Les Patterson - and then reduced to total silence, shedding noiseless tears as Sandy Stone quietly mourned the loss of a treasured lemon tree. This book has opened my eyes to so many other reasons why we find Barry Humphries' characters funny. It is as incisive an examination of the man and the art as one could hope to find. If you're looking for an intelligent, open-minded book, look elsewhere. This book is an utter failure. Absolutely nothing of merit here. 8. My gorgeous life; the life, the loves, the legend. There's a long British tradition of men dressing up as women on the stage going back to Elizabethan times and more recently in the Panto. Of course, Dame Edna and her creator, Barry Humphries, is Australian, but Australian but many of the traditions are the same and certainly the historical heritage is the same.